I recently decided to start blogging. Mainly because i'm constantly doing little projects here and there. As soon as i finish them i sort of forget. That's why i decided to start this blog so that i can document what i've done. This blog is going to be diverse. I want to try some more diy projects, dabble into photography, record my progression in pottery, and of course include some recipes. 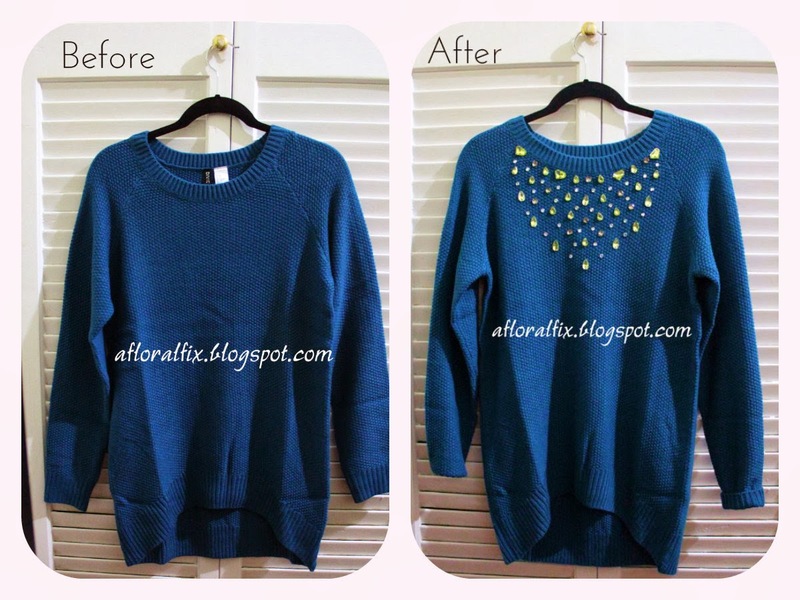 About a week ago I made this embellished sweater inspired by the "diy sweater" pins i've seen on Pinterest. I already owned a simple sweater that i could try out something on, so I thought I would give it a shot. (p.s. i've never done this before >.<) This is what i came up with...and you know what I'm really happy with the result ^.^. 1. 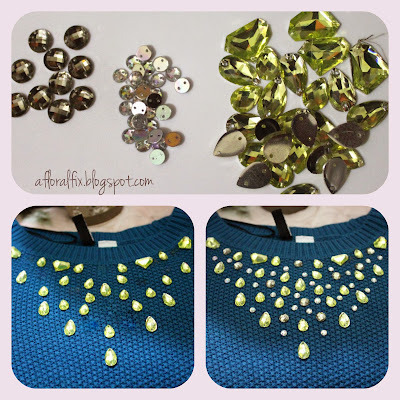 Begin by arranging the rhinestones on the sweater (I focused my embellishments around the collar). I suggest placing the biggest pieces first creating an outline. Then fill in the empty space with the smaller pieces. The goal is to have fun with it! If you don't like the pattern you've created, change it! And continue to rearrange until you've found the right pattern. 2. Once you've decided on a pattern, use fabric glue to secure the pieces. Wait 10-20 minutes for the glue to dry. I didn't have fabric glue instead i used mod podge (works on fabric right? so why not?). 3. Now hand sew your pieces on using your needle and thread. This way the rhinestones are sure to stay in place.